We wish more slots were like Secrets of the Phoenix when it comes to visual effects. Even the trivial paylines highlighting looks like a spectacular fire show. Not to mention the fantastic background and its alternative version in the free spins mode. The features are nice too - Raining Reels (cascading wins, basically), stacked wilds, and free spins. Go burn your way to the free spins. Secrets of the Phoenix is a hot slot by Gamesys, that makes a flashy first impression with its heart-warming graphics and blazing bonus features. It also has a lot of fire to it. The game looks fantastic, especially in a full-screen mode. The reels in the middle are surrounded by a fairy landscape with flying islands covered with trees and waterfalls. Really impressive. The animation is great as well. Whenever a winning combination hits, the payline is highlighted with flames, and if there are several winning paylines, they are combined into a fiery pattern, that looks like some magical rune. The features are just as cool. 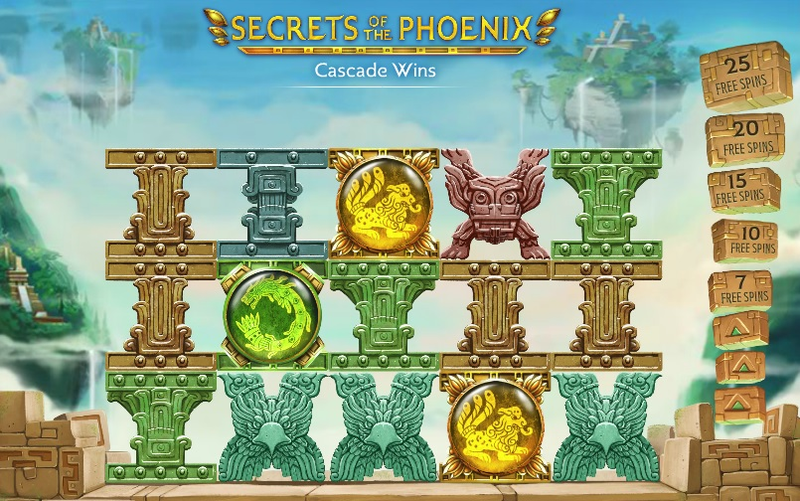 Secrets of the Phoenix offers the Raining Reels feature, stacked wilds, and a round of free spins. The main game feature is the Raining Reels. If you’ve played Gonzo’s Quest, you’ll find it familiar. The symbols that form a winning combination burst in flames and disappear, the the new ones take their place. This repeats till there are no new wins. If you manage to get 4 “cascades” in a row, you’ll get 7 free spins, and 8 cascades will give you 25 spins (that can be extended further). When you hit this bonus, the whole reel set drops under the ground, and the background changes to some ancient lava-lit temple interior. Another cool touch that adds personality to the game. When a winning spin causes the whole vertical reel to explode, it is replaced with a wild phoenix for the next respin. This usually leads to some massive wins, and potentially more wild reels. Secrets of the Phoenix slot is fun. Mostly because of the pretty graphics, nice animations, and cool effects. Gameplay features are not unique, but still nice. Definitely worth checking out. Click here to play Secrets of the Phoenix. Hint: the main secret is the hidden temple.